Following the success of Dermot O’Leary’s collaboration with Joe on ITV’s “The Nightly Show”, Joe returns to the show for the final week on Monday April 17th 2017. The show, a kind of current affairs/news satire, has featured a whole raft of great comedian/hosts including David Walliams, Jason Manford, Davina McCall and Gordon Ramsay. 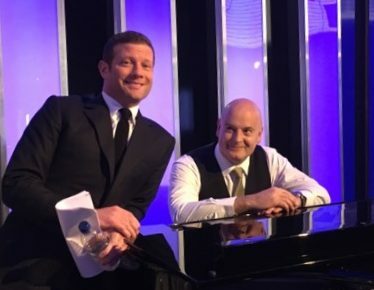 Joe’s been on-hand to provide live musical accompaniment for Dermot O’Leary’s week at the helm and thoroughly enjoyed the whole experience. Watch Joe introduce Megan Mullaly from ‘Will & Grace’ (YouTube).